Central Australia, NT. The Scone Drought Continues. | Sconquest. Nobody for miles until we reach the airport where it’s teaming with passengers coming and going. Surprised to find their are direct flights from Cairns and Perth for the whistle stop Australia tours and it’s about 3 hrs to anywhere so it really is Central Australia. Here’s a map. We’re flying Virgin as I’m addicted to maps as well as rocks and I like an inflight map with my cheese and crackers. 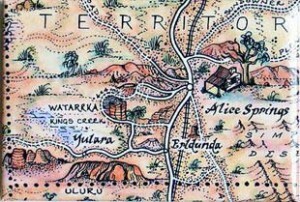 At Yulara I picked up the Journey Jottings Central Australia Map Journal with great drawings like the magnet above. Sadly, the scone drought continues. Practicalities like a lack of dairy cattle, keeping cream refrigerated over long times and distances have not seen sweets as a priority. Pubs don’t tend to sell scones either and we all prefer a long cool drink on a hot day. Be sure to visit the Pioneer BYO BBQ at Yulara Resort, it’s fun to chew the fat (that means have a chat) while you cook your preferred slab of meat on the barbecues. Undeterred I had a lovely cheesecake at Carmichael’s Restaurant at Kings Canyon Resort and managed to get excellent coffee and cake at Gecko’s Cafe at Yulara as you can see. Surprisingly, the coffee has been good everywhere. Whilst Yulara Resort has specials take the time to check your bill as it took four attempts to get ours fixed and we were still charged for videos we never watched. Everyone is in such a rush to be out for the sunset or sunrise that it’s easy to be caught out. It’s not the conversation you want at 6am on your last day before you leave. Although Yulara and Voyages Indigenous Tourism are owned and operated by the Indigenous Land Council, the local Anangu people are nowhere to be seen, not even at the Uluru-Kata Tjuta Cultural Centre or working at Voyages. No idea why, but it does seem strange. Totally enjoyed the 1300 kilometres we’ve travelled between Alice Springs and Ayers Rock, all those kilometres we’ve walked everywhere and even the early risings but now it’s time to head home into Sydney as the sunsets again. Where to next? This entry was posted in Alice Springs, Ayers Rock, Central Australia, Flight, Kata Tjuta, Kings Canyon, Maps, National Parks, Specials, The Olgas, Uluru and tagged geckos cafe, journey jottings, pioneer bbq, Yulara. Bookmark the permalink.